It’s an early July morning on the Neuse River in Oriental, and the air is thick and still. The sun has not even winked over the horizon yet and we are at the boat launch preparing to scoot across the river. The sea breeze hasn’t kicked in yet, and there is a spot on the bank that has been full of fish. As we slide across the water, school after school of menhaden, mullet, and bluefish scatter in our wake. Our captain for the day cuts the engines early, noticing some serious activity in a nearby cove. He quietly drops the trolling motor, and we ease our way in, stealthily approaching our target of the day. The entire area is filled with life: small shrimp scattering around the shore grasses near the bank, and pod after pod of baitfish showering on the surface. Suddenly, a breach that sounds like someone took a bowling ball and tossed it in the water…then another…and another. The big boys are in!! Excitedly, we jump up and grab our rods rigged with large popping corks and big soft plastics underneath and make our first cast. 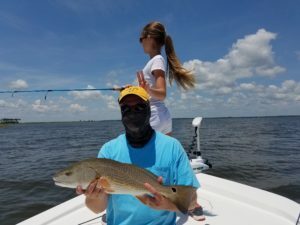 On the retrieve, we are thumping the corks, calling up the bull redfish with a concussive splash. We cast again and again, anxiously awaiting the strike. Then, out of nowhere, it happens! The reel starts screaming as an old drum has risen from the deep, mistaking the bait for a morsel of breakfast, and trying to make his escape. The fish is making his first drag burning run, screaming 100 yards of line off the reel. 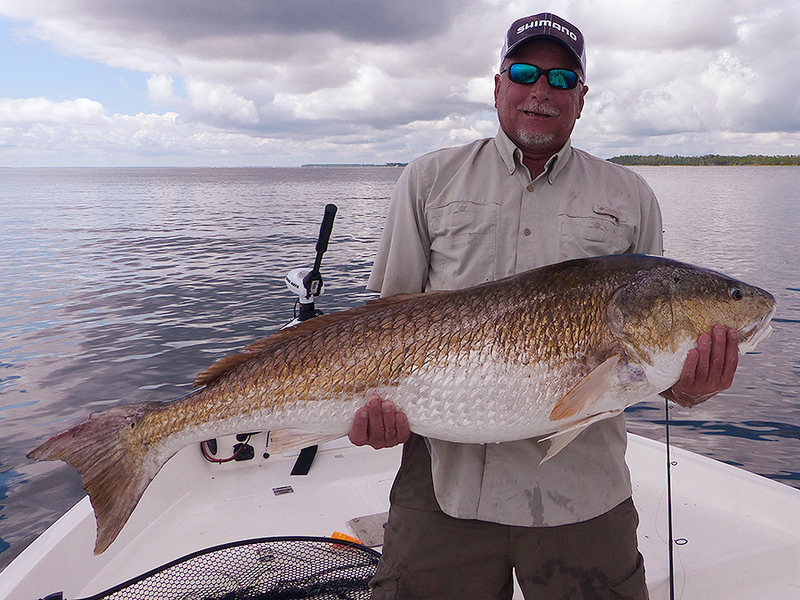 I apply as much pressure as I can to stop the behemoth, and start gaining line as I have him turned to the boat. That pressure just makes the fish mad, and he is off again making me re-earn every inch of line I had just won. After several minutes of this back and forth battle, we get one of the prettiest copper and bronze fish I have ever seen gently guided into the net. Then a few quick pictures and he is back over the gunnel of the boat to be revived and released. Tired and still shaky from the adrenaline, I lean back to chug down a drink and relive every second of landing that trophy old drum. But there is no rest to be had yet, the big boys are still busting on top. Really nice well maintained water front get away. Awesome view of the 4 mile wide river. Stewart is a wealth of knowledge for all things Oriental and Neuse. Located near the freshest seafood available anywhere on the east coast. Stayed here during the Oriental Boat Show and was very pleased with the room. The area is very peaceful and surrounding neighborhood was full of historic homes, restored and some not. Great little getaway! Excellent experience! Made reservations online, room was ready and waiting for us when we arrived. Room was clean, cool (a/c was on) and comfortable. Love the kitchenette, so nice to have a fridge, coffeemaker and microwave! Bed was super comfortable. Wonderful views right from the room. Bikes available to guests for free. We will absolutely be back soon! An excellent place to stay if you are visiting Oriental. They are dog friendly so you can bring your buddies with you, the rooms are pleasant and airy with a kitchenette. They even provided ground coffee for the coffee maker. The hotel is right on the sound with deck chairs and picnic tables to use while enjoying the view. While they do not have a restaurant, their are several within a few minutes walk. You can walk to the public marina in ten minutes and they offer free bikes for tooling around. We will stay with them again. The Silver Kings Have Returned!! Gary Young on The Silver Kings Have Returned! !